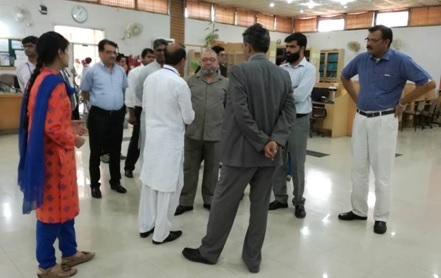 A team of Pakistan Engineering Council (PEC) visited Library Information Services, CUI Lahore on May 05, 2017 along with Senior Faculty members of EE department, for the accreditation of Electronics degree. Muhammad Ishtiaq Deputy Librarian & Ms. Nasira Munir welcomed and briefed them about library resources and services. Team also visited different sections of the library and admired the services and infrastructure that are being provided to the users.